I'm a little unclear about the charge balance aspect of an electron gun. Referring to this diagram and similar diagrams I've seen, what I don't get is wouldn't the target of the electrons have to be connected to the positive anode so that the electrons fired at a target can be recycled if the electron gun is needs to operate continuously? Is the target generally placed on the anode opening so it's connected to the positive? This is an Electrical Engineering question. The target is usually not in the hole (opening) of the anode. This is because, first, the hole is small. 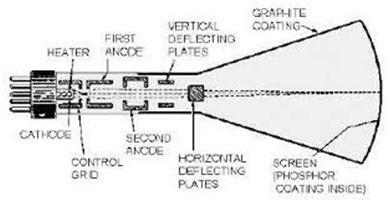 Second, you often want to be able to manipulate the electron beam, like what people do in the CRT TV. So the target is usually at the right end of your diagram, where your blue arrow points to. The target is usually connected to the anode so its potential is equal to the anode. You can either connect the anode (and your target) or the cathode to ground. In a microwave oven, the anode of the magnetron (a kind of vacuum tube with anode, cathode) is grounded. 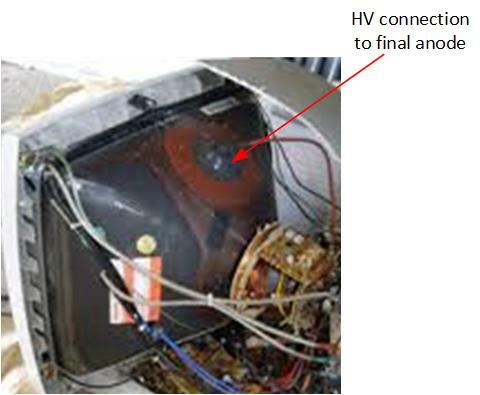 In a TV's CRT, the anode is at high positive voltage and other component (maybe the cathode) is grounded. 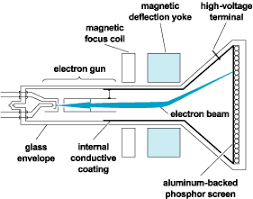 I cannot comment on the construction of a specific electron gun, but in a typical CRT, the internal surface of the tube around the screen is coated by graphite, forming the final anode electrode. This electrode is connected to high positive voltage and one of its functions is to collect electrons arriving to the screen. So you are absolutely right - any cathode ray tube or electron gun should have some return path for the electrons. It is not shown on your diagram, probably, because this diagram is simplified. The cathode source frees up lots of thermal electrons continuously and the electric field between cathode and anode accelerate them toward a specific direction. and until these two is working electron beam continues to exist with no problem. Not the answer you're looking for? Browse other questions tagged electrons charge electrical-engineering or ask your own question. Is an electron gun dangerous? Solve my confusion about electrons?